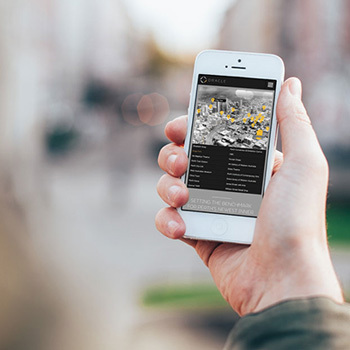 Web Design: The importance of going mobile first. Apple knew that the world was rapidly going mobile. In 1995 they estimated by 2010 the world would shop mostly online via mobile devices, they weren't far wrong. A responsive mobile optimised website for Oracle Apartments Perth. One of the primary reasons websites must be mobile responsive is due to the fact that a vast number of consumers are shopping online. It is currently estimated that approximately 76% of Australian internet users have purchased products or services online. This trend is expected to continue, as is the frequency and value of the transactions. Video marketing has also made huge leaps in market penetration in recent years. YouTube has reported they expect to continue to see an increase in online shoppers who conduct product research, via video content from mobile devices. Right now, YouTube sees an estimated 500 million people per month searching for shopping ideas, product reviews, and videos to share with their friends, an increasing number of them are coming in via mobile devices. Let’s face it: with the high volume of web searches taking place every day, having a mobile responsive website is likely to lead to more enquiries, conversions and sales. Since the mobile device was created, consumers can literally shop anywhere, anytime. Research tells us, websites designed to be mobile responsive have a much higher conversion rate when compared to websites that aren’t. Simplicity is the key, an efficient and intuitive user interface is paramount. 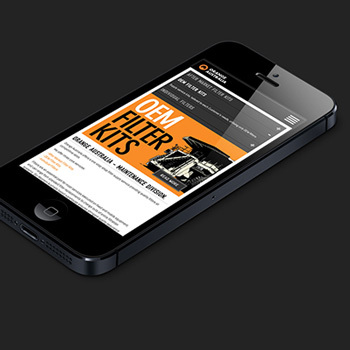 Mobile friendly web design for Orange Filters. Mobile users can also conveniently share their purchases and experiences with each other. Think about the last time you purchased a product online. Did you buy it on your desktop or mobile device? Now compare how convenient it was to share via your mobile device. Most smart devices have a full list of sharing platforms right at your fingertips so that, whatever you find appealing, you can announce it to the world in a matter of seconds with push-button ease. Lastly, but perhaps most importantly, a mobile responsive website should make it easy for your customer to make purchases. If you have a responsive website that is user-friendly and makes the experience simple and efficient, you will reap the rewards in terms of increased enquiries, sales and returning customers. WHAT’S AHEAD FOR MOBILE WEB DESIGN? Experts who track the analytics of sales online say the trend toward mobile devices will only increase over time. So the question is not, “Should I have my website optimised for mobile?”, it’s “Why didn’t I realise this before”. The key to a business’s online success is no longer enhanced by mobile capabilities – it is dependent upon it for its very existence. Mobile takes you where the customer is, improves customer relationships via social media, and gives you opportunities you never had before. Mobile devices have a window to the world that desktops just don’t have, and this will open more doors than you can ever imagine.